The School of Salerno in Italy was the first medical school in Europe. It had large input from Arab writers, the influence of its teachings and writings having a great impact on European medicine. 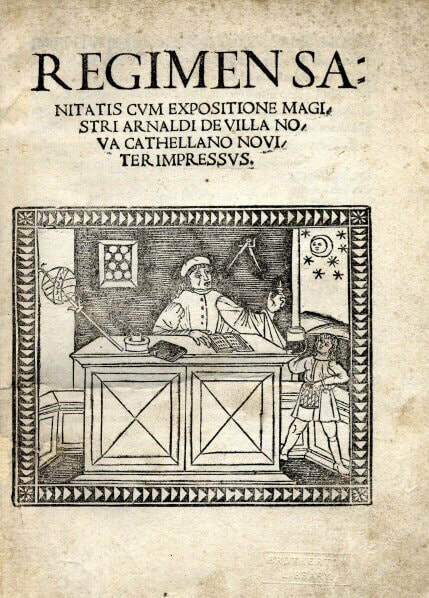 The Regimen Sanitatis (Regimen of Health), written in verse, is believed to have been written by the Professors of the School around the 12th Century (some believe as early as 1050) as a guide to maintaining Health for the common people. The following is a transcribed copy of the 1608 English translation in verse of the Regimen Sanitatis, translated for the King of England as a general guide to maintaining Health. We have loosely divided it into 5 main sections to make navigating the text more easy and have made some commentaries to help understand the text. It is worth noting that much of the information agrees with Ayurvedic and TCM theory on maintaining Health. And after-noon still waking keep your eyes. In heat, in cold, in July and December. At evening springs, at morning visit mountains. Are called Catarrh, or Tsfiqus, or the Pose. A Scape to be no loss of reputation. Sup light if quiet you to sleep intend.